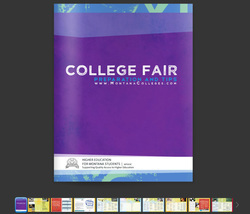 The Montana Post Secondary Educational Opportunities Council (MPSEOC) is a non-profit organization representing the 25 institutions of higher education across the state of Montana. The mission of the organization is the promotion of higher education to students, parents and guidance counselors, with the awareness of the post secondary opportunities available throughout the state of Montana and beyond. A thank you is extended to each participating institution represented. Each institution is thereby responsible for all copy and art that appears under their institutional title. What do you like about our website? What would you like to see added? Thank you!